In this project, Calacatta Bettogli, a white Alleanza Quartz with thick veining, is used for the kitchen island. Lining the kitchen perimeter is Shadow Gray Q Quartz, a gray stone that adds a clean look to the white cabinets. This two-tone kitchen balances both two different colored cabinets as well as two unique countertop colors, resulting in a seek kitchen design that complements not only the countertops but the backsplash, wall, and flooring! 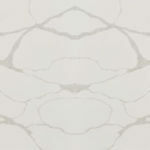 Low Maintenance: Quartz does not any require sealing because it is non-porous. This also makes it less likely to stain than natural stone. To clean, dish soap and water is sufficient. 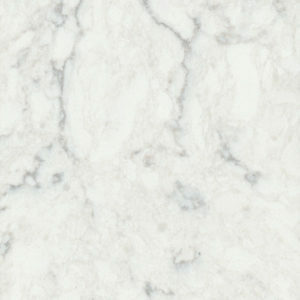 Variety: Because it is engineered, quartz comes in a wide range of colors.  Durability: Quartz is strong and one of the most durable countertop options; it won’t chip or crack easily. The perimeter and island both feature a straight edge (also called pencil or eased). While simple, it allows the stone to be the focal point of the kitchen without adding distractions. Have any questions about countertop options? Ask us or visit our showroom!